Crn. Robert Mugabe Avenue and John Meinert Str. 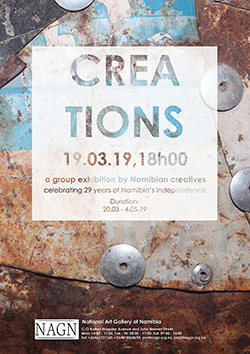 'Creations' is a showcase of works by Namibian creatives in celebration of 29 years of Namibia's independence. This project aims to bring creatives from various backgrounds, from the more “traditional” forms of making to the more “contemporary”. The exhibition’s aim is to provide a platform to a wider variety of Namibian artists, from all disciplines, to come into contact with each other through their art.